For thousands of children across Britain, joining the cadet forces meant going on adventures in a safe environment overseen by the Ministry of Defence. It also meant being drilled to follow orders and obey authority figures, something abusers exploited. The BBC sheds light on the dark world of sexual abuse that was covered up for many years. "It just started off with innuendo and comments," said Robert - not his real name - who joined the Army cadets as a 12 year old. "[It] then went on to touching." The memory of the abuse he suffered as a child still haunts him. Robert joined the West Midlands' Reserve Forces and Cadets' Association at its base at Tennal Grange in Harborne - a quiet, leafy area of Birmingham. On its website, the National Army Cadets Association boasts of its "long and proud history of preparing youngsters for all walks of life". Robert, whose name is changed to protect his identity, had no reason to assume his experience would be different from that of thousands of other children. But during the 1980s, cadets at Tennal Grange were subjected to what has been described as a "culture of abuse", an investigation by the BBC's Panorama programme has found. On one occasion, he was helping in the building's kitchen when he was approached by Peter Cooper, one of the adult instructors. "He said to me, 'I'm going to have something off you by the time you're 16'," he recalls. At the time, Robert said, he did not know what Cooper meant. "But I think it became pretty clear in a very short space of time," he added. One day Cooper told the young cadet to come to his house to pick up equipment for a trip. "He took me into his kitchen and raped me," Robert says. "I remember looking out the kitchen window and I was just looking at this fence in his garden - just transfixed on points - to hope it would finish quickly." Robert - whose obedience had been ruthlessly exploited - said he remembered feeling "utterly powerless". "You've got no power to fight it," he says. "You're a child and there's nothing you can do about it. "You're letting it happen because you've been brainwashed into thinking that this is all normal and part of growing up as a child." For Robert, the abuse he suffered happened more than once. He kept the secret, left the cadets and embarked on a successful career as a police officer. But during his time as a police officer, he was called to Birmingham's Steelhouse Lane Police Station to help make an arrest. "I was told to go to one of the rooms to wait for these other officers to turn up and in walked Peter Cooper," he says. His abuser was also a police officer and had served with West Midlands Police for more than 30 years. "I think that was a real turning point in my life because when he came in, he stuck his hand out and pretended I was his friend," Robert says. "So I shook his hand and that scared me because I was an adult at that stage. I suddenly realised that even though this abuse was never going to happen to me again, this individual still had a huge amount of control over me." In later years, what worried Robert even more was the child protection role Cooper had taken on within the force. "He was investigating people who were committing offences against children," he says. After the meeting at the police station, Robert felt so traumatised he said he considered killing himself. But he steeled himself to give a statement to colleagues about what Cooper had done to him. "I just broke down one day, walked out the office and at that point for me, I was at a huge junction where it was, 'end your life or report it'. It was as simple as that," he says. Thanks to Robert's evidence, Cooper was jailed for five years in 2007 for sexual assault. Cooper had denied the charges during his trial and maintains his innocence to this day. However, Cooper was not the only abuser active at Tennal Grange. Martin was also a young cadet at the centre where his commanding officer was Brian Leonard. "The atmosphere was one of a military establishment," he recalls. "You learn very quickly to obey orders, to do as you are told and not to question." There was a culture of abuse from the offset, he recalls. At his induction the young cadets were ordered to punch each other in the face as hard as they could. Crying was forbidden. "I was systematically abused and raped repeatedly over many years," Martin says. "The thing it was so blatantly obvious, it was almost as if it was hidden in full sight. "You are trained to follow orders and you are trained to respect the officers and do as they tell you. "That includes having to lie on the floor on a dirty blanket and just lie there and take it. "You just follow the orders, do as you are told, lie on the floor and take it like a boy." The BBC has spoken to 10 men who were abused by Leonard in the 1980s. When Sarah - a girlfriend of one of the victims - threatened to report Leonard to police in 1987, cadet officers pressured her to keep quiet. Sarah sought out Leonard after her boyfriend told her he had been abused at cadet camps. "It had ruined his life," she says. She confronted Leonard at Tennal Grange. "He just looked and smiled at me," she recalls. "He said, 'Oh, don't be stupid. [Your boyfriend's] a liar." Leonard began pushing her and Sarah picked up a chair to defend herself. "I remember I was going to launch it at him but then this other sergeant came in and saw me," she says. "He said, 'What the hell's going on here?' and I told him." The sergeant said he would take a statement from Sarah but no investigation into Leonard was ever carried out. She was also warned not to approach the police. "Leonard said if I went to the police it would be me more in trouble than him because they'd got proof I'd attacked him," she says. '[They said they would] deal with it in their own way because I didn't have evidence." Brian Leonard died in 1996, having never faced justice. Today Sarah says she feels disgusted by the Cadets' failure to investigate him. "I feel sick. I'm haunted by it," she says. "They should have been protecting me and my boyfriend but they didn't." 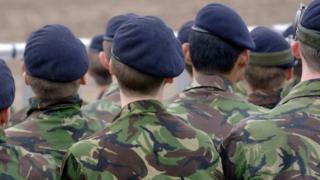 The Ministry of Defence says it now has "robust procedures" in place to protect cadets. "Child sexual abuse is an abhorrent crime," it said. "We encourage anyone who has been a victim, or knows someone who has, to report it to the police." It added the Cadet Forces was reviewing cases of historical abuse to determine if they were handled correctly and if further action is necessary. But many of the victims, like Martin, feel the abuse has shaped the course of their lives. "I will never really know who I should have been," he said. "I was selected to join the Royal Marines. I was told I should go to Sandhurst and get a commission in the regular Army. I will never get those years back and those opportunities back." For information and support for anyone affected by sexual abuse - including sources of support for children, young people and concerned parents - please see the listings on BBC Action Line. Watch BBC Panorama - Cadet Abuse Cover Up on Tuesday 4th July on BBC One at 22:45 BST, and in Northern Ireland at 23:10 BST and 23:45 BST in Scotland and afterwards on BBC iPlayer.